Teaching how one can defend oneself in all occurrences of violence, and how to counter all grips, pushes, punches &c.
Most useful against troublemakers and those seeking to offend others, or that threaten one with a knife. with privilege from the states of Holland and West-Friesland. 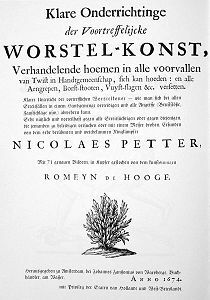 Prof. Sydney Anglo calls Petter's book "historically speaking, the most important treatise on unarmed combat ever printed... the finest of all wrestling books and deservedly the most famous" (the Martial Arts of Renaissance Europe, p. 190). It was first published in 1674 and reprinted several times, including one complete plagiarism. The combination of Petter's lucid descriptions, devoid of all jargon, and de Hooge's masterful depiction of pain and violence in the engravings, elevates the book to its position of solitary eminence. It is also probably unique in presenting an effective and complete unarmed combat system in a format from which it would be actually possible to learn. This translation is based on the version included in "Chronik alter Kampfkunste", Weinmann, Berlin, 1997 [isbn 3 87892 031 8]. This version has only a German translation for the preface and address, and I don't know how close this is to the original. The first half of the German preface is also quite obscure. My rendition should thus not be considered as an exact translation of the original. The actual technique explanations are translated from the original Dutch. In the original they are not, by the way, in verse. Many of the phrases used in the book can be rendered in a lot of different ways. Where alternatives are possible, I have chosen one that seems to make most sense in the context of the illustrations. I have sometimes restructured sentences whenever I felt it necessary for clarity, but have tried to stay as close to the original as possible (as the effect is often quite humorous). I have taken great care not to "improve" on the original, and where I could not keep from adding information, this has been indicated by a note. Notes are enclosed by square brackets [like this]. The original groups the captions by chapter, separate from the illustrations. Here each plate is placed under the corresponding explanation. About the translator (Eli Steenput): I started practicing martial arts in 1992, and hold some dan ranks in Chunen Butori Ryu, Iaido and Aikido (and HB ranking from Bill Mears soke, Hard Bastards America). During the last couple of years I have also been interested in the study and reconstruction of old European martial techniques. Besides this and being a native speaker of Dutch, I have no qualifications for translating Petter's book. Actually I started on the translation thinking there was none available in English (and that it would thus bring me fame, wealth and the adoration of millions). As it turns out a different translation of Petter is available here, which I found after almost completing my own. As no single translation can ever do full justice to the original, I encourage the reader to compare both translations whenever a section is unclear. I dedicate this translation to all those who have so generously taught and continue to teach me their arts. This translation was published in the Journal of Western Martial Arts (October 2000). The wisdom of the sharpest minds of this or past centuries, no matter how admired they may be, would be soon lost, were it not for Writing. On the other hand, practical experience and inventive study by a smart intellect have given many new insights to this world. Practice perfects knowledge! It is not enough to understand matters with a quick mind, only one who has practiced will be able to apply his knowledge. There must also be instruction to make an art known to others, without which it would disappear with him that invented it. Time, dedication, practice, and a quick mind are beneficial to give this art its own life and also some finesse. The ever active intellect, if it has been developed by continued practice and dedication, will give its owner much joy and support. Apelles could, only because of his trained mind, imitate nature with paint and brush so well that it seemed nature itself had borrowed the shapes of things from Apelles. Another artist will control his chisel with his trained mind, to form stone in shapes for which nature should not be ashamed. Indeed it would seem that while nature always strives for perfection, it is in art that we see it more often displayed. It is not my intention here to disparage nature, whose manifestations fill us daily with wonder and amazement. I intend rather to represent the actual character of an Art and to promote the reverence for her. In addition I want it to be examined by everyone- the diligence and interest of everyone should therefore be excited. The forces which were lent to the human understanding by nature, are not present alike in each art, and even if they were, then they would nevertheless not be developed in the same way. Of two arts one is usually superior, this is in general the one based on knowledge. Most people do not seriously consider how they could secure themselves against all manner of abuse or assault, as might be leveled against them by evilhearted villains, eager for violence. Our wrestler has studied this problem, first developing his mind, then looking for effective strikes and holds, by which one can defend against violent attacks with shoves, punches or a knife. These he has practiced diligently, and, to benefit the community, he has decided finally to compile this instructional book on the art of wrestling. Cruel Death has untimely taken him from us, before he could bring this project to conclusion. The images had already been prepared during his life, ordered and provided with explanatory captions to instruct the studious wrestler. Therefore we no longer want to keep this excellent and useful art from the world, particularly since many enthusiasts have insistently requested its publication. We want to publish this also for the benefit of the world, in that it may help check criminal violence. Receive therefore this new, outstanding and useful art, of which no man should remain ignorant, with friendly thankfulness. Study the techniques diligently, and practice them. You will never regret the effort, on the contrary, you will enjoy many good fruits from your labor, you will be able to easily discourage and reduce aggressive behavior, and thus even those ignorant of this art will benefit, as they too will be able to move about in peace and unmolested. Honored reader, this art is here presented in such way that everything you may want to know about it, is duly described. You find here a very clear ordering of all body parts. Which technique is appropriate for a given attack, follows from the ordering of the illustrations, and so nobody would confuse the fighters drawn, they are marked A and B, B and C, C and D, and so on. And because variation is always pleasant, so sometimes A will be the victor, and sometimes B. The different clothing worn by the fighters shown on the plates, will also help to distinguish them by their appearance, as will be noted by the attentive reader. Those wanting to experience this art in reality, or wanting to receive personal instruction, can contact Nicolaes Petter's student Robert Cors, who has practiced all techniques many times with the master. He is prepared to instruct interested parties in these techniques for reasonable remuneration. He can be reached at the Witwe house of Nicolaes Petter on the Prinsengracht in the Gustavusburgh not far from the combat academy. There all lovers of this wonderful art will find such complete joy, that they will feel indebted forever. Use this art to your advantage, but may you always gratefully remember the one that gave this art to you. Then the future will see others, who by their trained mind will continue to enrich the art with new techniques. Live well!